Its official, Roberto Soldado is now a Tottenham FC player as the club announced on their official website. The deal was brewing for a long time, from last year even when Valencia CF rejected Tottenham's offers, with Soldado content on staying as well, but this year with the difficult financial situation from not being in the Champions League and Tottenham willing to pay the 30 million release clause the deal has been made. Tottenham had a bit of pressure from Liverpool FC and decided to step up their pursuit of Soldado and meet the release clause of 30 million euros. Roberto Soldado is said to be earning about 5 million euros salary at Tottenham, way more than he was getting at Valencia CF. 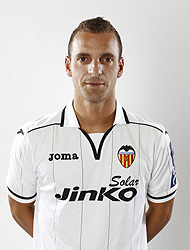 I wish him good luck in his new club and hope Valencia CF find the proper and suitable replacement for him.